I am a long time reloader of both pistol and rifle, and have been reloading 45 for about four years now. 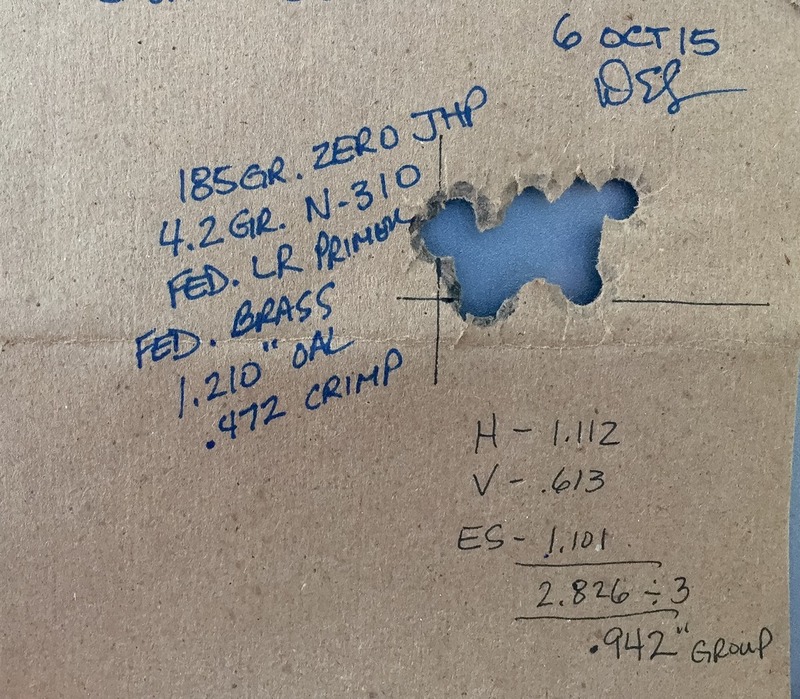 On my 45 target loads, I have been using WST at 4.2 gr's and a crimp that usually comes out to around .471 to .470 depending on what brass used, but is usually closer to .471. I have been happy with this as the crimp on the case edge seems to be a good match for 1/16 to 1/8 inch down the case. The question I am asking is that many, also experienced loaders, on this forum recommend a crimp in the .469 range, and some as low as .468, what is the reasoning for this, as when I have tried to crimp to this, and after pulling bullets to check the crimp, have always experienced what to me would be over crimping of the bullet as to be visibly compressed in at the case junction. I was always taught not to over crimp, but there seems to be two schools of thought as I always had some compressing of the lead at .468-.469. If it matters, I am using Dardas 200 LSWC. Tighter crimp increases powder burning efficiency. If you're getting sooty brass and unburned powder increasing crimp can help. Let your ransom rest be your guide..I do not crimp super tight. At 8/10 thousand psi chamber pressure for bullseye loads the crimp provides minimal resistance ..
Jerry Keefer wrote: Let your ransom rest be your guide..I do not crimp super tight. The first Kart barrel I had on my first wad gun was frustrating at best, until I did some experimenting with crimp levels. For some reason that tube just wouldn't shoot until I got down to .465. My load at the time was 4.3 WST, 200 gr Lazercast SWC, Win brass and WLP primers. Every one of the other 3 Karts like a more normal .468/.469. The only time I've gotten really good accuracy with .470/.471 was when I played with some Zero swaged bullets. As Jerry put it, let your Ransom rest tell you what your particular barrel likes. I don't have Jerry, KC or Jon's knowledge level, never will, but the test target I received from Dave SAMs had a pretty loose crimp. Folks with more knowledge/experience like Jerry could comment on the "why". I've had great results at .470 and still exceptional accuracy with the tighter crimp and no reliability issues. Jacketed bullets don't use as much crimp. I guess I need to just try crimping some down a bit more, and comparing them to my normal crimp. While I do not have any actual target pistols, two of my 45's are Dan Wessons, a Valor, and a Custom built Silverback, and both seem quite accurate. We'll see if I can tell the difference, with my shooting abilities. May have to look into buying a Ransom Rest someday, as this is becoming quite addicting, and I have shooting berms, and a bench on my property. I also have Wesson 1911's in 9mm and .40 that I load for, so I could probably make good use of it. Any suggestions on who to go to on the purchase of a Ransom rest, and possibly free shipping? Do I just need the rest and a set of 1911 grip inserts? Thanks' everyone, for all your time and help, I do appreciate it. I hope the article comes though okay, but there was an AMU post on this today. Seat a bullet to the correct COL. Back out the seating stem. Then with the round in the fully raised ram, screw the die in by hand, crimping as you go. Can not over crimp this way if brass is all the same length. Final test, will round drop in to the barrels chamber? If not, a hair more taper crimp is needed. The crimp does little to nothing when it comes to burning powder. Neck tension is what matters. The different in case thickness, gives more or less neck tension. A range of 45 to over 100 lbs using different brands of brass. Ransome now makes a one-piece unit that combines the rest and windage base into one unit, at a few bucks savings. Champions Choice and Brownells both carry Ransom products. Don, Would the windage option be mainly used for ease of centering your groups in a chosen area of the target? Yes. Without the windage base you are pretty much stuck with using a big sheet of paper and trying to jigger the whole unit around. This leads to having a unit that is not anchored down well enough. If you are going to use a Ransom, you need the windage capability and you need to put some real thought into what you will anchor it to and how. I'm fortunate that my club uses solid concrete rifle benches that must weigh 500 lbs and are anchored into the concrete pad of the firing line. It does make a difference how solid your mount is. musky wrote: I am a long time reloader of both pistol and rifle, and have been reloading 45 for about four years now. On my 45 target loads, I have been using WST at 4.2 gr's and a crimp that usually comes out to around .471 to .470 depending on what brass used, but is usually closer to .471. I have been happy with this as the crimp on the case edge seems to be a good match for 1/16 to 1/8 inch down the case. The question I am asking is that many, also experienced loaders, on this forum recommend a crimp in the .469 range, and some as low as .468, what is the reasoning for this, as when I have tried to crimp to this, and after pulling bullets to check the crimp, have always experienced what to me would be over crimping of the bullet as to be visibly compressed in at the case junction. I was always taught not to over crimp, but there seems to be two schools of thought as I always had some compressing of the lead at .468-.469. If it matters, I am using Dardas 200 LSWC. huge compression made at the lube groove site? do vised testing to determine what factors give your pistol the best reliability and accuracy. I want to thank everyone for their helpful thoughts and suggestions. You have given me some very valid points to consider. I think my first order of business, is to build a better shooting bench. I guess I am very fortunate to be able to do this on my own property. I have another custom Dan Wesson due any day now, so I guess I need to decide if I should go for it, and order the rest at the same time. I'm sure the best suggestion to me would be to work on my shooting skills more, as both my sons can out shoot me most of the time with my pistols, but it would be nice to know that my reloads are preforming the best that they can be. Also would just be fun, having the ability to adjust loads, and see the affects on accuracy. The problem with posted crimp # is everyone doesn't do it the same. 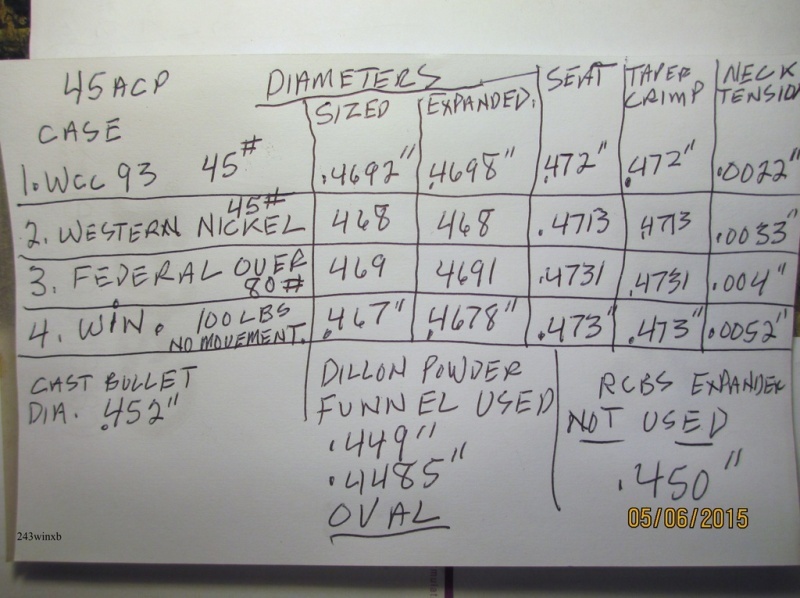 One mans .472 might be .469 with just a hair more pressure on the jaws, so test your rounds just like the AMU does if possible in your loads with your crimp numbers and try several different ones to find not only the best accuracy but also what functions every time. A round that hits the X @ 50 yards every time but fails too feed now and then is way worse than having 90 rounds that shoot 10 ring@50 yard's every time. Two alibis in the same portion of a match, NMC, timed or rapid means you loose all those points from the second alibi. This can mean the difference between being the national champion and taking home nothing. Function is paramount regardless of crimp.